Bourbon Jungle by Johan & Nyström is the first specialty coffee that I recommend to friends and acquaintances who want to try specialty coffee. The reason is that Bourbon Jungle is a blend of beans from different continents and is similar to the taste profile that many have at home. The difference with this coffee is the quality of the treatment, the bean, and the roasting. 2) 115g water in a circular flow (this includes 40g water blooming). This including 40 second blooming, your timing should be on 1 minute and 15 seconds. 3) 110g of water in a circular flow with a finish (about 10-15g) on the edge. A total brewing time of 1 minute and 40 seconds. Review: The coffee is a blend and because of that the taste profile is well balanced, the coffee is dark roasted and therefore has a powerful taste. There is a light smokiness in the back of the mouth, not as clear as in a whiskey, but it is there in hiding. 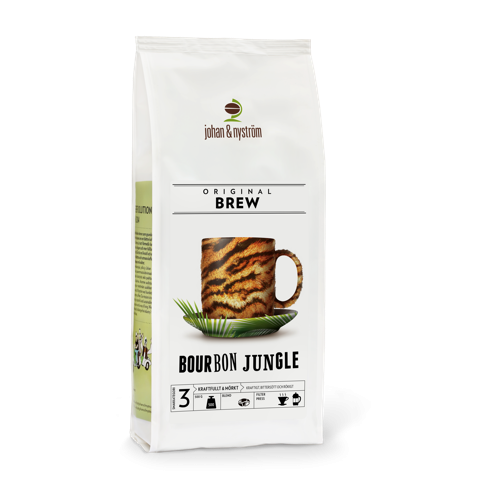 Bourbon Jungle is a coffee that is usually identified as a morning coffee and is personally best brewed with an Espro. I prefer to brew with Pour Over when the coffee has a lighter roast. The reason is that the lighter the roast the more aroma the coffee has and demands a cleaner brewing method, that does not let through a great number of oils that can limit the delicate tones. Hej Paul! Jag köpte detta i helgen och måste säga att du har helt rätt, min vän visade din blogg och han har hela tiden sagt att jag ska köpa bättre kaffe, så nu har jag. Tack för rekommendationen, jag följer dig framöver.